Uganda Wildlife Authority (UWA) and Uganda Police Friday raided a palatial home in the suburbs of the capital and arrested three men believed to be dealers in the illegal ivory trade. The law enforcement agents, who were acting on a tip from the Natural Resources Conservation Network, a local non-governmental organization, also seized an estimated 1.5 tons of ivory products during the Friday evening raid. The two suspects, confirmed to be natives of Guinea Bissau, and one from Liberia will be charged with illegal possession of ivory. “Thanks to concerted efforts by the government, the elephant population is on the rise in Uganda. But this country continues to be a major ivory trafficking conduit, and we are seeing with this latest incident just how much the illicit ivory trade continues to wreak havoc on the continent—on African wildlife and security in particular,” said Kaddu Sebunya, president of African Wildlife Foundation (AWF). The seized ivory was transferred to UWA pending presentation at the court as evidence. As of this morning, the marking, counting and weighing of the ivory was still ongoing to ascertain the exact total volumes, which took three vans to transport. 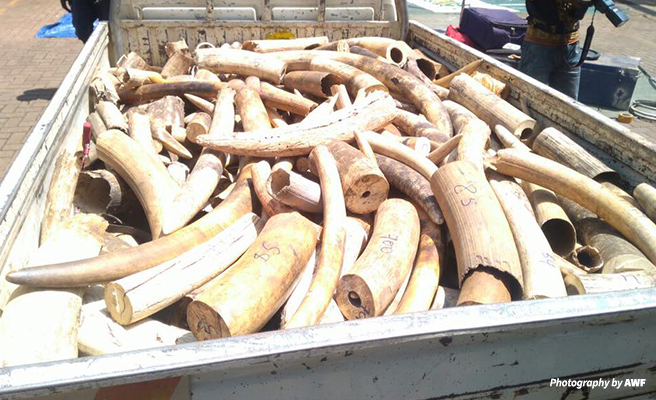 The ivory seizure comes in the wake of continued and sustained engagements between African Wildlife Foundation (AWF) and UWA to strengthen security at the country’s key border points. As a key partner for UWA, AWF last year helped establish Uganda’s-first-ever wildlife detection dog program. Through its Canines for Conservation Program, AWF trained four dogs and 12 UWA handlers. The detection dog units have since been deployed to Entebbe International Airport in Kampala, Uganda, where in a single month they made 21 busts. AWF and UWA recently placed a request to State House for unlimited access of ivory sniffer dogs to Uganda’s points of entry and exit especially airports. There has been overwhelming response and it is expected that Ugandan President Yoweri Museveni will officially launch the Canines for Conservation program on March 3 during World Wildlife Day celebrations. Patrick J. Bergin, CEO of African Wildlife Foundation, added that stopping Africa’s natural heritage from being stolen off the continent requires global cooperation and political will to shut down the harmful trade. “Illegal wildlife trafficking is such a monumental problem that it cannot be resolved by one country alone. We hope this event highlights the continued need for governments around the world to do their share to ultimately save these iconic species—not just in Africa but also in Europe, United States and around the world. ” he said. Some of the documentation found with the seized ivory indicated that the contraband was en route to Kuala Lumpur Malaysia. A recent report by TRAFFIC titled Malaysia’s invisible ivory channel: An assessment of ivory seizures involving Malaysia from January 2003- May 2014 points to Malaysia as the world's paramount ivory transit country. Which wildlife species do you want to see on a safari?